I walked past him, I'm wary of Big Issue sellers as the ethos behind the magazine seems to be lost but he did something that surprised me. A family with two young children went past and as they did he offered the magazine and they declined. As they continued he shouted back to one of the kids and passed them a pound coin and said that's ten bob each. "It brings a smile to their faces, I always remember when I was a kid and someone gave me ten bob I was over the moon so I would rather do that from time to time as it makes me feel good"
It worked, I heard the kids as they walked off saying to their father why can't they all be like that? The significance of the money in the title? Mick has spent 22 years in prison, was released only two days prior to this portrait. He has worked out just what it cost for the government to keep him in prison for his "rehabilitation" back into society over those 22 years, £3.5 million! On the day of his release he was sent on his way with £47, no where to live and only the clothes that a local charity had given to the prison. The odds are he will back inside within the next few months and the cost will continue to spiral to keep him there. 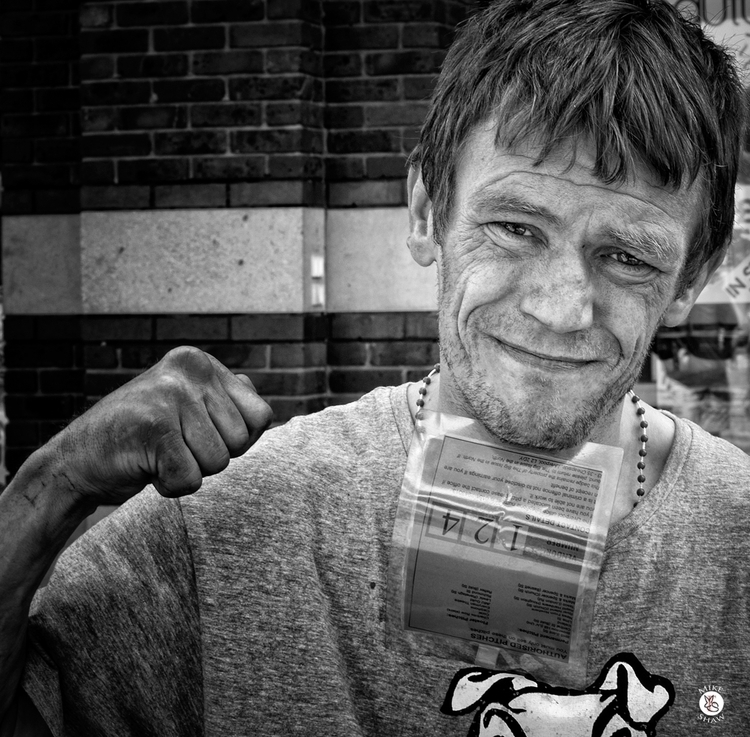 The pose he took was his own, I simply asked for his photograph and his story and this is the pose he struck, the raised fist, the broken nose and scars he bears of someone that is used to fighting.